The Alert class displays a customizable alert message to the user. Action(index: Int, title: String) Use this event to be notified when user selects a button. func Alert(title: String) Create a new Alert message with a specified title. func Alert(title: String, message: String) Create a new Alert message with a specified title and message. func Alert(title: String, message: String, buttons: List) Create a new Alert message with a specified title and message plus an array of buttons titles. 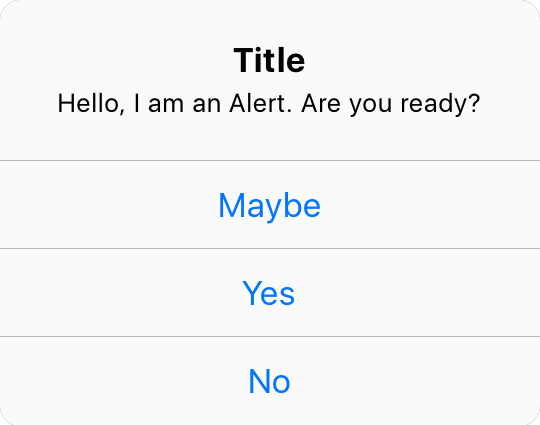 func Alert(title: String, message: String, buttons: List, closure: Closure) Create a new Alert message with a specified title and message plus an array of buttons titles. The closure parameter enables you to specify an action to be executed when user press a button (button index is passed as parameter). func addActionWithTitle(title: String) Use this method to add a button to a newly created Alert. func show() Display Alert to the user.